A web platform to review the status of Recruitment Agencies has been launched. The plarform allows workers to comment on their experiences, rate the recruitment agencies and learn about their rights. 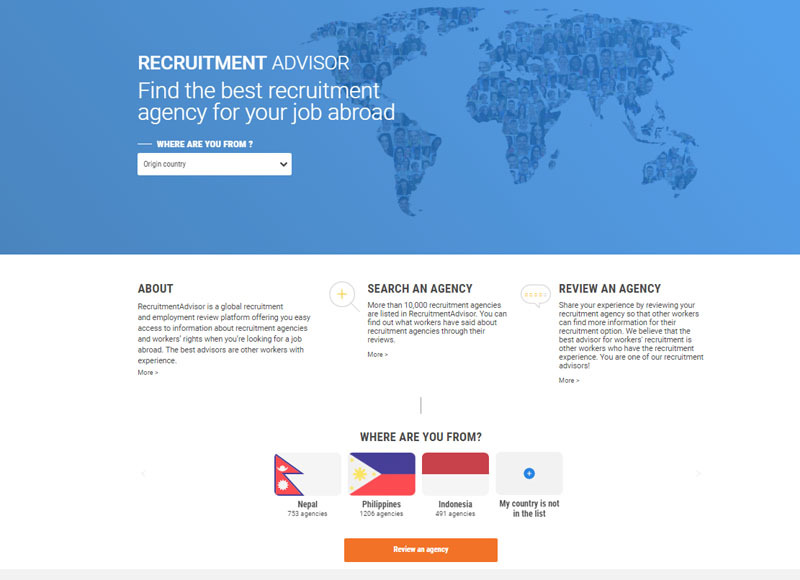 The ITUC has launched the Migrant Worker “Recruitment Adviser” Platform www.recruitmentadvisor.org to protect migrant workers from abusive employment practices, by providing them with peer-to-peer reviews about recruitment agencies in their country of origin and destination. The website has been launched in Nepal, Indonesia and Philippines at once. Initially available in English, Nepali, Indonesian and Tagalog, it will be further developed in more languages. In Nepal there are thousands of Man power agencies and lists of all Manpower agencies can be found in the Website www.recruitmentadvisor.org . This platform can help migrant workers make critical choices at the time of planning their journey to work in a foreign country.